The song Kyrie may unintentionally point us toward some strong Biblical lessons about God’s presence in our lives. 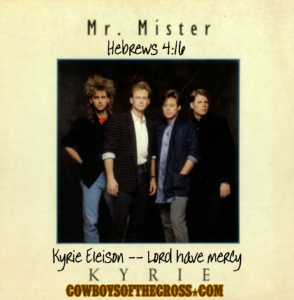 Kyrie eleison means “Lord have mercy” in Greek and when I learned that as an adult, the 80s song Kyrie by Mr. Mister became a favorite all over again. It’s still a ‘play it loud’ song for me and is regularly on rotation traveling to rodeos and bull ridings. (link to the song in the comments since Facebook hates external links). While many readings and phrases that are repeated in Catholic church services are in Latin, the Greek words, Kyrie eleison, are, as I understand it, still used. 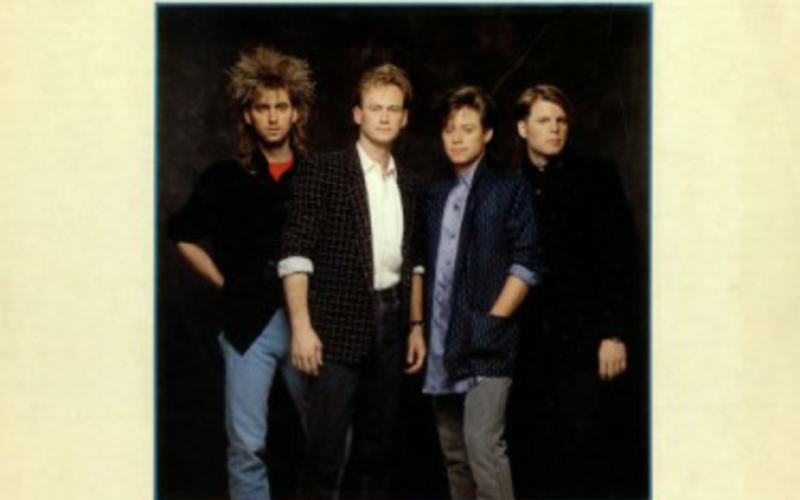 Kyrie eleison, where I’m going, will you follow? Lord have mercy, down the road that I must travel. Lord have mercy, through the darkness of the night. Lord have mercy, where I’m going, will you follow? Lord have mercy, on a highway in the light. It isn’t straight-up biblical but there are biblical encouragements in this as we look at scripture and what we can take from the song. Hebrews 4:16 — Let us then approach God’s throne of grace with confidence, so that we may receive mercy and find grace to help us in our time of need. Every week, we’re out there on the roads together. Whether we’re in the same truck or rodeo wagon, we’re on the phone, texting or snapping but one way or another, we’re sharing the journey together talking about bulls, times, runs, judging, the ground conditions and sometimes even what we’re going through. More of then people realize, conversations about God and the Bible come up and sometimes we’re praying for one another. His mercy and grace are there for all who want to receive it. Instead of punishment for our sins, we can be forgiven through repentance and a saving faith in Jesus Christ–that he died to take the punishment for our sins that separate us from God without the forgiveness He gives us (His mercy and grace) when we truly repent and ask for it. As we travel this week and weekend, and any time, I just want to encourage us to take time to pray for one another and those who have not yet experienced God’s mercy and grace. If you don’t know where you’re going, a GPS isn’t any help. Jesus directs us to our final destination. All content Copyright Cowboys of the Cross. Any element can be shared, and we encourage it, but it must include a credit to cowboysofthecross.com so others can be pointed back to the gospel and teaching available on this site.